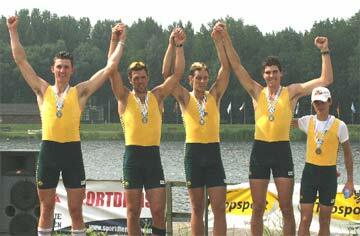 These Under 23 World Championships were held at Hazewinkel, Belgium on 20-23 July 2006. Racing on the finals day was in very fast conditions with many world best under 23 times being attained. The tour was a short two week trip which clearly worked well and was obviously well managed by the team. The early results did not look great but there was significant improvement through the racing week and finally good results. Noel Donaldson and Krys Szatsznajder reported on the team on repechage day on the RA web site as follows: the fighting spirit [of the team] was a great trademark and with two additional days to prepare the skills and tactics will add to the determination to establish the final race positions. 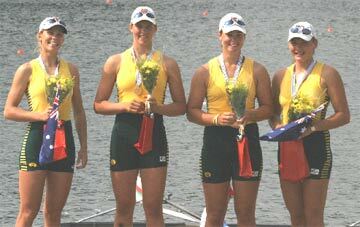 The women's four was Australia's best performing crew. They won their final well leading from the start and extended their lead throughout the race in a very even fashion. 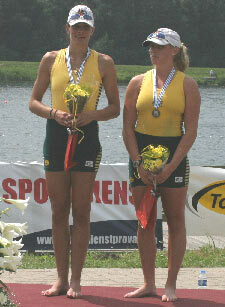 Verena Stocker was quoted as saying that they had a perfect race in the very fast conditions. 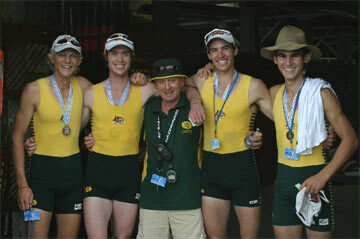 The men's coxed four won silver in a tight race. The Australian maintained a narrow lead through the first 1500 metres but could withstand a blistering finish from the Kiwis over the last 500 metres. The finishing margin was 0.59 secs. This crew improved well during the regatta. The men's lightweight quad scull raced well with Hugh McLeod quoted on the FISA web site stating that the race was: Enjoyable - close to the best thing we've ever done! We were never certain during the race that we could be on the podium until the end. The crew was in fifth place for the first 1500 metres and then came home strongly to pick up a bronze. As with many of the Australians present, three of the crew were racing internationally for the first time.